Of course, the day it is proved/discovered/understood is the day it ceases to be paranormal – it becomes normal. 'Today's magic is tomorrow's science' and all that. That seems to be Kripal's take, as he quotes Pauli -> "It is my personal opinion that in the science of the future reality will neither be “psychic” nor “physical” but somehow both and somehow neither." Kripal calls this the Super Natural, that our world just has some weirdness to it but this weirdness is part of us and our lives all the time. One thing I've noticed is if you travel around America, not to mention other parts of the world, many people have a weird story or two. Some Psi effect, maybe an encounter with the dead, maybe just some odd lights or shadows or some against-the-odds perfect synchronicity. It doesn't necessarily effect their day to day life, save perhaps giving them some sense of purpose or just the realization that science cannot capture every aspect of reality. That's not quite what I meant, though I note the similarity to one of my favourite quotes, from Geraldine Finn: We are always both more and less than the categories that name and divide us. Incidentally, do you have an address for The Scientific Establishment? I would simply have asked her if she has a list of crop circles, or is able to point to some specific crop circles, that her lab work can label as "genuine", non-mechanically flattened. Just having that answer could then allow anybody - circle makers, other researchers, amateur investigators, etc. - , to see if that holds up in terms of investigating the possibility of people being involved in creating those. The report is worth reading in its entirety, in that it deals with specific formations for which, in some cases, good photographic evidence of man-made construction can be found in online archives. For those formations, this evidence automatically makes irrelevant her reported plant sample anomalies, and demonstrates that such anomalies are more common than she would have us believe. That Talbott rejects such photographic evidence as a means of distinguishing "genuine" circle formations from man-made ones is bizarre, not to mention highly unscientific. Her position only makes sense when you consider that virtually every complex formation betrays signs of human construction to those with a trained eye. If Talbott were to accept these evidential signs as valid, there would be no point in obtaining field samples for any but the most simple and primitive formations. How to work out a crop circle is man made GUARANTEED! He focused on foot lines, stomp marks and construction errors. I share his implicit view that, unless one believes non-human intelligences would deliberately and consistently mimic human techniques of circle construction, and in the order humans would make them, these artifacts are telltale evidence of the human origin of complex formations. 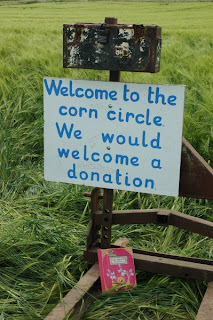 I must back up a bit by saying that the quality of crop circle photography varies considerably. It's often challenging to find high-resolution photos shot from just the right angles to capture details of human construction. In many cases, the details are often subtle in even the best photos. One reason for this is that not all formations are photographed soon after discovery, so crowds trampling the crop may unwittingly destroy evidence. Another reason is that circle makers sometimes adopt crop flattening techniques that, for large portions of the formations, can all but make foot lines and stomp marks invisible to the camera. In formations where construction details are scant, or when photographic quality is poor, I think only experienced circle makers are qualified to offer evidence of human creation. With these thoughts in mind, I've scrutinized photos for many of the formations referenced by Talbott in her report, and found what I believe to be unmistakable evidence of human construction in the majority of them. I'll list them in another post, along with pertinent remarks about the details, followed by some of Talbott's comments. For those cases in which Talbott thinks a plasma discharge was (or possibly was) the causative factor in producing plant abnormalities, I found nine formations (names bolded above) for which there are online photos that I could evaluate for evidence of human construction. In seven of them I think the evidence is good enough to dismiss Talbott's findings, and suggest that the abnormalities she and BLT have documented are probably a lot more common than expected. If this is indeed so, her methodology is useless for distinguishing "genuine" from man-made formations. Because in-depth sampling and subsequent intensive laboratory work was not carried out in 2009 we cannot be 100% certain that the visible plant changes we found are absolute proof these formations were genuine. But an educated estimate can be offered in several instances. a: Stomp marks, fairly well defined on left side. b: Enlarged foot lines for inner boundaries of tail feather section, apparently leading to the center of the circle located between the bottom halves of the wing feathers. Also, a partially obliterated foot line at the top of the circle. c: Circles on either side of the creature's neck are not symmetrical. The group on the right appears to be arranged badly. a: The intersections of outer partial rings. I'm guessing the main order of operations here was to first lay down the small center circle, followed directly by the inner ring. Next the six-pointed star was formed. After that the outer partial rings were formed by connecting each star point with the next-plus-one point. After all the rings were finished, the ring intersections were used as the centers for the formation of the outer circles. Finally, the crop inside these circles was stomped down, leaving shadows of the ring intersections. b: Another view of the same formation, showing concentric stomp marks for two of the outer circles. Talbott's comments: Even with only three sets of samples and controls we can be very close to certain -- with clearly visible apical node elongation in nearly all the samples and expulsion cavities not only in nearly every 2nd but also 3rd node--that this formation was not flattened with planks or boards. a: Very faint stomp marks appear to be visible along the lower outer rim of this formation, as well as in some of the structural lines within. Regrettably, the resolution of this image is too low to state anything definitive. Talbott's comments: We thought it would also be helpful to note Charles Mallett's usually very reliable field observations regarding this formation: he states he observed a "significant number" of biological anomalies ("blown" nodes and/or elongated nodes) in Phase #2 (http://www.silentcircle.co.uk/rpt092.html). a: Fairly well defined stomp marks. b: Faint foot line across circle. The line was laid down first, then the circle was centered on it. c: A crudely made branching line. Another view showing stomp marks and a much clearer trace of the widened foot line crossing the large lower circle (sorry, forgot to mark it with a letter!). Talbott's comments: And so, in spite of my original impression that this extraordinary formation was almost certainly mechanically created (not least because it's appearance was so singular), after seeing the clearly elongated apical nodes in all the sample sets from all 3 phases, and after seeing the control plants for Milk Hill #4 which were all taken from the SW corner of this same field, I think it's possible this one could be the "real McCoy." a: Widely spaced outer rings, vs.
b: Narrowly spaced outer rings. There's really not much to say about this simple formation except its apparent errors, and the perspective might have something to do with that. I would not say this photo is good evidence for man-made crop formations. Wow. Absolutely terrific detailed work, Doug. Thanks so much for all of that effort. That seals it for me. a: Very well defined foot line for the large inner circle. a: The edges of the bottom three feathers on the right are pointed instead of curved, and second feather from the bottom is noticeably wider than its counterpart on the left. b: There's a hole missing in this feather. c: This feather has two transverse lines when it should only have one. The line directly below the hole was placed in error. d: The bottom transverse line in the feather on the right is too low. It should be raised to make the feather more symmetrical with its counterpart on the left. e: This object (whatever it is) is wider on the left of the vertical bisection than the right. f: The left fang (?) is thinner than the right, owing to 'e' above. Talbott's comments: We can offer only a tentative conclusion regarding this formation's origins based on (a) the fact that node bending was filmed within a half-hour of the circle's discovery, (b) the node bending is downward (instead of upward as would be the case if caused by photo- and/or gravitropism), (c) there is moderate apical node elongation in the few samples we have, and (d) there are some expulsion cavities in the 2nd nodes -- all of which indicate exposure of the plants to energies known to be associated with a plasma discharge. a: Traces of the foot line running through the centers of all the circles. It was laid down before the circles, and each of the circles is centered on it. b: Foot lines used to construct the circles, visible from below. c: Concentric stomp marks inside some of the circles. Another view showing more easily discernible traces of the foot line used for later construction of the circles. Talbott's comments: The plant changes found in Sample B (taken from the small "grapeshot" on the left, nearest the tramline in photo above) revealed a clear reduction in seed-head development -- which was not seen in Samples A and C, taken from larger downed-crop areas. All three sample sets did contain expulsion cavities in all of the 2nd nodes beneath the seed-heads, as well as in some of the 3rd nodes. a: A few well defined stomp marks in the upper-left "wing". b: Alignment errors (tips of the "tail" don't line up symmetrically with the circle they're connected to. c: The "ding-dong" at the top of the photo doesn't appear to properly line up with the "bird" and the large circle it's connected to. Furthermore, what's with the squishing together of the fanciful "glyph" lines near the top of the photo? Another view, showing some well-defined stomp marks under the right "wing", along with the alignment errors mentioned above. a: Well defined concentric stomp marks for nearly every patch of flattened ground in this formation. They're even visible in some parts of the circles. In addition, it's easy to see circle lines crossing other circle lines. An experienced circle maker could probably use this information to determine which circles were laid down first. b: This crescent seems to me a little smaller than the others. In the interview, in relation to the blinding issue, Alex brings up Colin Andrews' blind testing of BLT's plant analysis in 1995. This surely isn't new for the people who are already closely keeping up with the crop circle topic, but last year Andrews spoke out when Nancy Talbott made certain claims on the Coast to Coast show. So did key members of Talbott's sampling team. Reading this raises other concerns for me about BLT's methodology. These samples were sent according to the BLT protocol to Levengood’s lab. Despite Talbott's assertions otherwise, they were clearly labeled as a crop circle and wind damage and as two separate events in the same field. This can be viewed on the video and is supported with documents on the website link. They were also photographed and the images were included with the samples. It is disingenuous indeed to claim Levengood thought the samples were different areas of the same circle. James and I had been talking to each other for a number of weeks about the doubts we had with the result's (sic) that Levengood was sending to us, it was then we decided to flatten some wheat and send samples to Levengood and from the results we had back we knew that he was doing something wrong during his research process (everything came back positive when we knew this was not correct). By the way, in the interview Nancy Talbott says William C. Levengood only used the title "Dr." "towards the end of his career". He died in 2013, but in that first link above Andrews has a letter written to him in 1993 where Levengood is using the title "Dr". Also, Talbott seems to have resorted to the same sort of "you are not qualified enough to understand this" response to Andrews as she did with Alex. Looks like a different crop/grass? With all the crop circle pictures, I was reminded of the following snow patterns I came a cross a few years ago. Just as spectacular and absolutely man made. Ok. Perhaps barley that's been cut long and regrown? From above I think we can see the path of the tractor/mower. I'm talking about the concentric/spiralling tractor lines from the centre of the circle. If it was cut young, say a foot high, like any other grass it will resprout. This explains the more 'bushy' growth in the circle compared to the more normal barley appearance outside the ring. Under that scenario I suggest that the photo was taken a week or two post cut. Alternatively the affected areas could have been sprayed young with some sort of toxin or growth hormone to encourage anomalous growth in the plant. 2. There was no immediate difference between the flattened plants and the standing plants, except that some were flat and some were standing. 3. Most fields in Wiltshire are conveniently accessible. 1. Says you. It's hard to see from the photos. Perhaps just driven over. I am sure we are seeing concentric/spiral tyre tracks from above.